Do You Call Yourself an I or a We? As an independent professional, you’re faced with whether to call yourself “I” or “we.” The alternative is to use only a company name and risk producing awkward copy for your website. Awkward, because when you don’t feel comfortable owning that you’re an “I,” but don’t want to claim you’re a “we,” you end up with passive language or other clunky constructions. Worse, you simply can’t express some ideas using only a company name in your verbiage. I’ve gone back and forth on the issue. I’m coming down on the side of being an “I.” I really am an “I.” I don’t become a “we” because I extend my services by working with other professionals. Not in a true sense, unless this happens on every project, which it doesn’t. Some who all themselves “we” when they’re really an “I” might have a good rationalization. It makes me squeamish so I’ve always avoided “we,” and, well, have a hard time describing my services and client case studies with ease and clarity. Many of us think that potential clients won’t take us seriously if we are a solo-person business. But times have changed. The latest figure I could find is that there are over 20 million, single-person businesses in the U.S. One stellar person might run a business better than an army of young hacks. Quantity often doesn’t equal quality. It’s the work you do and the relationships that matter. It’s how you talk about your services and what you can do for people, that will either reassure them you can get the job done, or not. 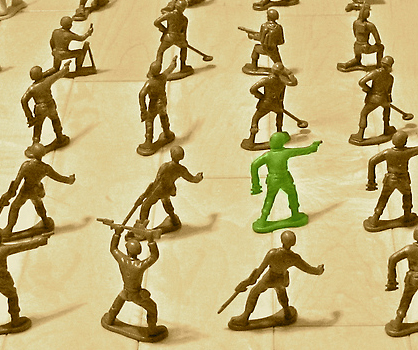 With your imaginary army, you might land a client who would otherwise be concerned about hiring just one person. But it’s better to wave your particular flag in a way that makes you feel comfortable. More and more, people hire others for why they do what they do and who they are, and not how many workstations or awards they have. And then there’s the case of bios written in third-person. This is appropriate if you’re writing a bio for a speaking engagement. But most people reading a bio written in third person know you wrote it yourself. We should feel comfortable personalizing our bios and our work. “I” and “we” are such teeny words compared to why we do what we do and who we serve. • Try writing the same chunks of copy three different ways. Is there a version that allows you to say what you need to say? • Find other solo business websites. How do they communicate about themselves and their services? Does one resonate with you? There are plenty of very successful business and marketing consultants and coaches who have written wildly successful books. • If you’re concerned about using “we” when you’re not a “we,” try using “I” and your company name, which will add some variety to your copy. The company name might work perfectly in some spots and not others. • Most powerful of all is to use “you” as much as you can, referring to your ideal customer and what they get by work with you. I’d like to hear from others who have struggled with this same issue. Have you gone from being an “I” to a “we” or vice versa? How does it feel? We think y’all brought up good points. Wi’ve done both. “We” feels fake, “I” sometimes feels too small and vulnerable, but it’s what’s true. So that’s how it stays now. I do a combination of I and we, to demonstrate both the personal aspects of the I, and the sometimes group aspects of the we. Or at least that’s my justification. I absolutely understand this conundrum. Thanks for reading LeAnn. I’d love to see an example of how you’re doing it if you don’t mind sharing or sending a link.